The machine operates pretty well; however, it has to be kept plugged into the AC adapter. The batteries tend to self discharge and won't start up the system if I leave it unplugged for more than a day or so - even when shut down. The sleep mode works okay. I still have a Mac SE/30 that has a bad internal hard drive, but also an outboard external one that works. I will have to start it up someday. I used to be (still am, actually) in charge of the Prescott, Arizona Macintosh User Group recycling project, so I saw a lot of older Macs come through, and we usually got them working again. We gave them to organizations like Big Brother/Sister and individuals that needed them. Most were easy to work on. A Performa 6400 with a TV tuner made a great TV/cable set, among other things. 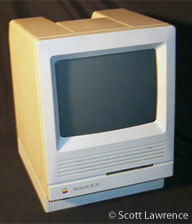 I still use a Power Mac 6100/60 AV as a monitor for a VHS recorder. A couple models were a real pain (the 6500 and 8500 come to mind - you have to disconnect mother board cables to even expand memory; they ended up at the computer abbatoire). Recently I received a Blue iMac G3 with 1 GB memory. To my surprise I found it could run Tiger (Mac OS X 10.4) very well. I put a library program into it for use at a local church. Note that the slot-loading iMacs that have a FireWire port and the little door in the bottom to get at memory/AirPort board/battery (if you have small fingers) are desirable older machines. The older tray-loading iMacs are seriously limited. PS: I'm writing this on a Beige G3/266 MHz with 288 MB RAM running Mac OS X 10.2.8.